Not a big moon photographer, but read that Jupiter was going to be in the crescent of this mornings moon. I was up, so what the heck. Jupiter was far away and never going to be in the crescent before the sun rose, but the moon seemed quite interesting through my 420mm lens on a crystal clear morning. My question is how to prevent the side facing the sun from being blown out, making all the easily visible craters disappear?? By the way, this was handheld, D 850, 5.6, 1/400, ISO 7,200. It was supposed to be in the imaginary cup formed by the crescent, just past the darkened moon. Looking at my astronomy app, and the conjunction was likely 2/27, however...you might get a similar chance in a month. Jupiter just doesn’t move that fast across the sky. On a related note, my app showed that all planets should be visible now in a given all-night session (while I doubt you could raise Pluto with a consumer telescope, it is in the mix). Shoot and dither into sepia, adjust contrast on you computer. "Blown out" means over-exposure. Try bracketing your shots. I don't shoot many in that phase but you won't need anywhere near the ISO you set. There are always a flurry of "what happened?" topics after full moons and at least 90% are due to over-exposure. If I find any crescent shots, I'll let you know. Best wishes! 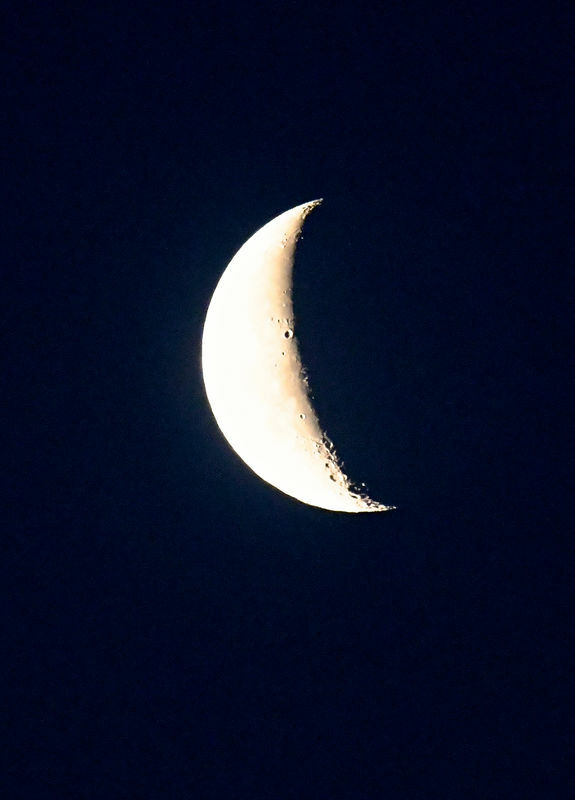 I am not an expert but have taken quite a few moon shots over the last 5-6 years and can share the following. 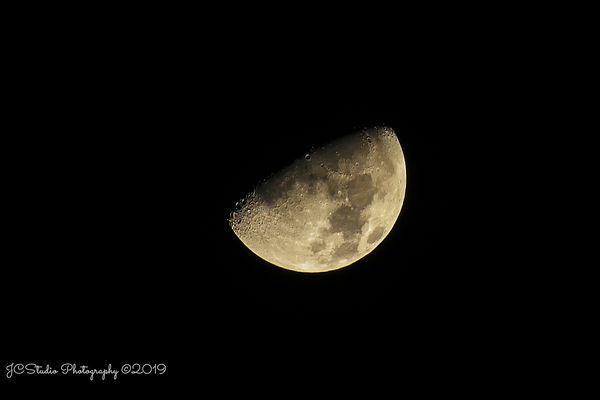 Your camera needs to be set to manual mode because aperture and shutter priority metering will blow out the detail of the moon surface due to the dark sky. Typically you can set your ISO around 400. For a bright full moon, I will make my first shot at around 1/400 shtterspeed and a wide open aperture. Then I check the image and enlarge it to check for detail. From there I make adjustments to shutter speed dropping to 1/200 and then typically somewhere between 1/200 and 1/400. For half-moon or crescent moon shots, I adjust my starting shutter speed lower to account for the darker moon light. Also, my Olympus OMD EM1 MK II has a fold out screen and I find using it with Live View on, is extremely helpful when the moon is high overhead. I am typically shooting with my 100-400 lens on a ballhead on a tripod. I find handholding is not possible for me to get sharp moon images. Good luck with your future moon shots. You don't need to shoot the moon at such a high ISO. Shoot in manual mode with ISO set to between 100 - 400 at f11 (or f8) (trying the different combos to ensure you will have a high-enough Shutter speed) and select a shutter speed that is approx. 1.25X-1.5X the focal length of your lens (since you have a high MP sensor in that D850) and you mentioned you are hand-holding the lens. So if your shooting your zoom lens at 320mm make sure your shutter speed is at minimum 1/400 or 1/480 to get the best results (this is somewhat dependent on your shooting technique coupled with how steady your hands are). The OP cannot shoot an 80-400mm zoom lens zoomed out to 320mm at 1/100th for shutter speed while hand-holding and expect to capture sharp images. For that they would need to mount it on a tripod or use a bean bag on top of a vehicle or other stable object. Sunny 16 for the bright side. Spot on! By bracketing. I recently worked with my daughter-in-law with her basic Canon T5, tripod and kit lens. She wanted--and got some really great shots of the moon! How--by keeping it simple-- bracketing. Film is cheap--because she wasn't using any. Don't be intimidated with all that 'fix it in the mix,' stuff....that will come in time. Be creative--and HAVE FUN! //...Not really sure what operating system, or software, Ansel Adams used, and his stuff is pretty cool.